In Level One of this series we explored ways to report using ExoGrids. 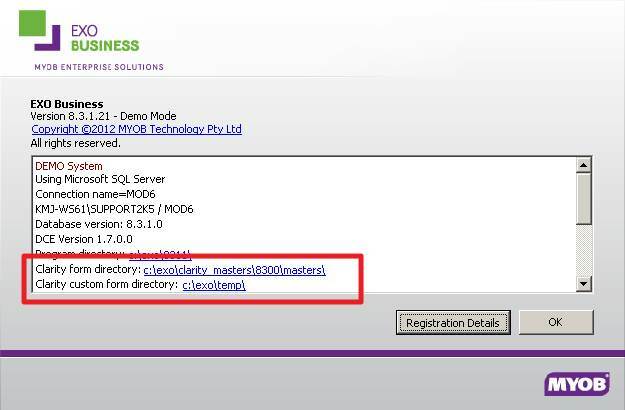 This time we look at Clarity – an integrated report writer for MYOB EXO. Most financial software packages use reporting software of some description to produce business forms (e.g. Debtors Invoice). MYOB EXO has a customised version of a Report Builder application by Digital Metaphors, which is integrated in the product and branded “Clarity” report designer. 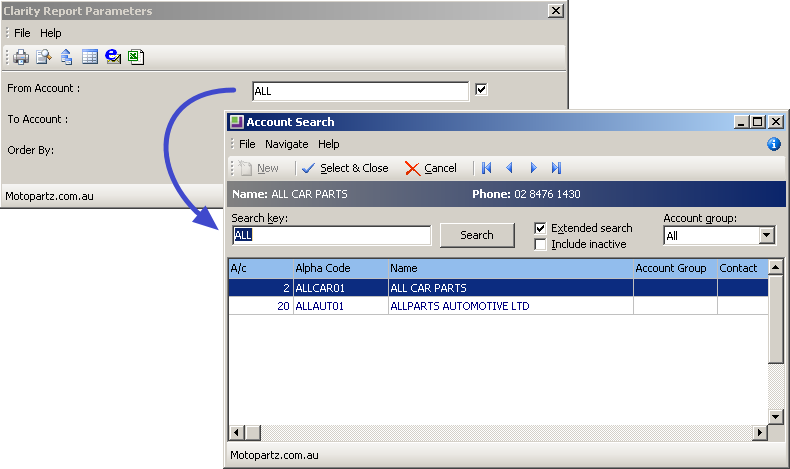 Standard forms and reports in MYOB EXO Business are built in built in Clarity. There is over 400 standard forms and reports in recent versions. Technically both are reports with exception that forms are called from the screens and “know” which transaction to print. I will use the word “report” in the text below, but everything equally applies to forms. Reports are stored as files with instructions on how to collect and display information. These instructions are stored mostly as text, but we never look the raw text as such. Clarity report writer is used to create and modify reports. MYOB EXO reporting is structured in such a way that the system will look for a file in “Custom” folder before going to “Standard” one. This means a custom report will be given priority over a standard report. Any standard report can be altered to contain company logo, colours, fonts and distinct graphics design elements and then saved to “Custom” folder. This allows super-users and consultants make customer-facing business forms with consistent corporate identity and keep less used or internal forms default. When in EXO go to Help drop-down menu > About. The screen will display your Custom and Master folders. Clarity report writing does not require much technical knowledge. User can create a basic report by choosing an EXO table and dragging and dropping data into a page template. A report is readily available to print or you may choose to copy to Excel via a grid. It is possible to change report presentation using controls similar to Power Point (see screenshot for “look and feel”). Report preview function allows a report writer to view and correct changes before the report is deployed or even saved. Clarity Reports have many exciting features, some of which include sub-reports, charts and graphs, easy data and run-time calculations. For those with technical aptitude, Clarity allows detailed event control that can change the whole behaviour of the report. It is even possible to create interactive reports and dashboards with Clarity. 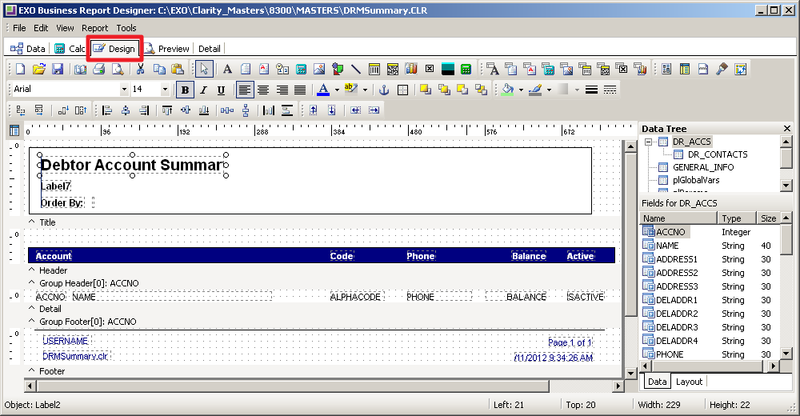 This all can be achieved if we delve into custom scripting (SQL and Delphi). Clarity program code is embedded in every user-facing module in EXO. This means report writer launches instantly without any delays. It also helps report writers avoid complexities of connecting to right database. Clarity is part of EXO so it runs in the same context. All standard forms and reports are built in Clarity and so are Clarity dashboards. EXO has many ways to link Clarity reports to system: drop-down and business flow menu; drop-down selections at runtime; standard and custom buttons. In return, Clarity “knows” a lot about its host – EXO system. Reports can use staff ID of the currently logged in user and any of user profile values (e.g. default branch) to limit data visible to users for security purpose. All filters would apply dynamically as user runs a report. As example a report can allow a sales rep see data for his / her accounts only, but sales manager will be able to see that for every account. There’s more to Clarity: If you used EXO for a while you may have noticed that some of the report parameters in Clarity are inherited from EXO – e.g. Debtor Account search screen. For most users that comes as granted, however, very few reporting tools in mid-market systems allow such user experience. MYOB has promised there’s more of those “native” search parameters to come in future versions. Not only we have native search, Clarity can also open an EXO Debtor Account / Creditor Account / Stock Item or Job Costing screen in EXO versions 7.0 – 8.4. In EXO v8.5 MYOB will introduce a hyperlink technology that will allow Clarity to pop open any transactional screen (e.g. a Sales Order).